Sure, it’s fun to share a good laugh. But did you know it can actually improve your health? It’s true: laughter is strong medicine. It draws people together in ways that trigger healthy physical and emotional changes in the body. Laughter strengthens your immune system, boosts mood, diminishes pain, and protects you from the damaging effects of stress. As children, we used to laugh hundreds of times a day, but as adults life tends to be more serious and laughter more infrequent. By seeking out more opportunities for humor and laughter, though, you can improve your emotional health, strengthen your relationships, find greater happiness—and even add years to your life. Why is laughter the sweetest medicine for mind and body? Laughter relaxes the whole body. A good, hearty laugh relieves physical tension and stress, leaving your muscles relaxed for up to 45 minutes after. Laughter boosts the immune system. Laughter decreases stress hormones and increases immune cells and infection-fighting antibodies, thus improving your resistance to disease. Laughter triggers the release of endorphins, the body’s natural feel-good chemicals. Endorphins promote an overall sense of well-being and can even temporarily relieve pain. Laughter protects the heart. Laughter improves the function of blood vessels and increases blood flow, which can help protect you against a heart attack and other cardiovascular problems. Laughter burns calories. OK, so it’s no replacement for going to the gym, but one study found that laughing for 10 to 15 minutes a day can burn about 40 calories—which could be enough to lose three or four pounds over the course of a year. Laughter may even help you to live longer. A study in Norway found that people with a strong sense of humor outlived those who don’t laugh as much. The difference was particularly notable for those battling cancer. Laughter stops distressing emotions. You can’t feel anxious, angry, or sad when you’re laughing. Laughter helps you relax and recharge. It reduces stress and increases energy, enabling you to stay focused and accomplish more. Laughter draws you closer to others, which can have a profound effect on all aspects of your mental and emotional health. 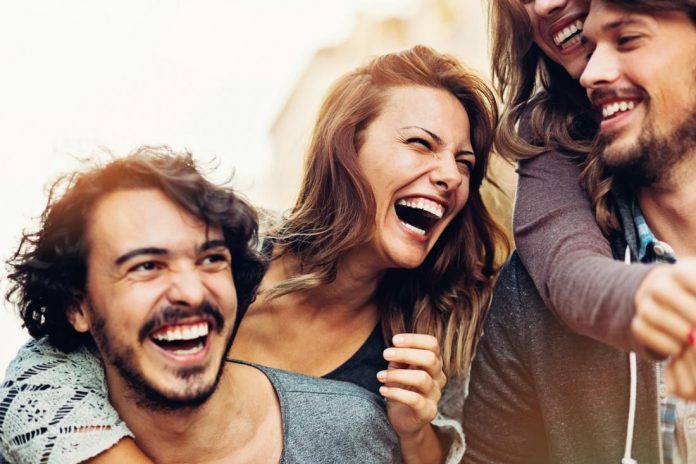 Sharing humor is half the fun—in fact, most laughter doesn’t come from hearing jokes, but rather simply from spending time with friends and family. And it’s this social aspect that plays such an important role in the health benefits of laughter. You can’t enjoy a laugh with other people unless you take the time to really engage with them. When you care about someone enough to switch off your phone and really connect face to face, you’re engaging in a process that rebalances the nervous system and puts the brakes on defensive stress responses like “fight or flight.” And if you share a laugh as well, you’ll both feel happier, more positive, and more relaxed—even if you’re unable to alter the stressful situation itself. Shared laughter is one of the most effective tools for keeping relationships fresh and exciting. All emotional sharing builds strong and lasting relationship bonds, but sharing laughter also adds joy, vitality, and resilience. And humor is a powerful and effective way to heal resentments, disagreements, and hurts. Laughter unites people during difficult times. Be more spontaneous. Humor gets you out of your head and away from your troubles. Let go of defensiveness. Laughter helps you forget resentments, judgments, criticisms, and doubts. Release inhibitions. Your fear of holding back and holding on are set aside. Express your true feelings. Deeply felt emotions are allowed to rise to the surface. builds up your relationships rather than breaking them down. Laughter is your birthright, a natural part of life that is innate and inborn. Infants begin smiling during the first weeks of life and laugh out loud within months of being born. Even if you did not grow up in a household where laughter was a common sound, you can learn to laugh at any stage of life. Smile. Smiling is the beginning of laughter and like laughter, it’s contagious. When you look at someone or see something even mildly pleasing, practice smiling. Instead of looking down at your phone, look up and smile at people you pass in the street, the person serving you a morning coffee, or the co-workers you share an elevator with. Notice the effect this has on others. Count your blessings. Literally make a list. The simple act of considering the good things in your life will distance you from negative thoughts that are a barrier to humor and laughter. When you’re in a state of sadness, you have further to travel to get to humor and laughter. Spend time with fun, playful people. These are people who laugh easily–both at themselves and at life’s absurdities–and who routinely find the humor in everyday events. Their playful point of view and laughter are contagious. Even if you don’t consider yourself a lighthearted, humorous person, you can still seek out people who like to laugh and make others laugh. Every comedian appreciates an audience. Disclaimer: The products and supplements mentioned on this site are not intended to diagnose, treat, cure, alleviate or prevent any diseases. All articles on this website are the opinions of their respective authors who do not claim or profess to be medical professionals providing medical advice. This website is strictly for the purpose of providing opinions of the author.